Over the last couple years, I have come to love making jam. The patience it takes, slowly stirring the bubbling juice waiting for just the right thickness. The simplicity of the recipe, just fruit and sugar, and maybe a squeeze of lemon. Its practicality, turning fruit that’s almost gone bad into something that will last a year after it’s been canned. And finally, I adore the rich colors. Cherry jam has the most luscious hue, close to what I imagine Dorothy’s ruby slippers would look like. For the last two summers, I thought jam making was just my newest fascination until I started writing this post and remembered the first time I made homemade jam. I was in 8th grade and all my friends were hanging out at our friend Erin’s house. As we lounged in the sun drinking lemonade Erin’s mom told us she was making jam and asked if we wanted to crack open a few pomegranates for her. Every kid loves the tart juicy seeds of a pomegranate so we all readily agreed to help. We sat around the table gossiping and breaking open pomegranates until the table, our clothes and our mouths were stained with red juice. After a while my friends lost interest, but not me. I stuck by Erin’s mom the entire afternoon absolutely entranced by the jam making process. I took home a new found love of jam making and three jars of fresh pomegranate jam. Since I began making my own jam a couple years ago I have been on the lookout for yummy things to do with all the jam that ends up in my fridge. 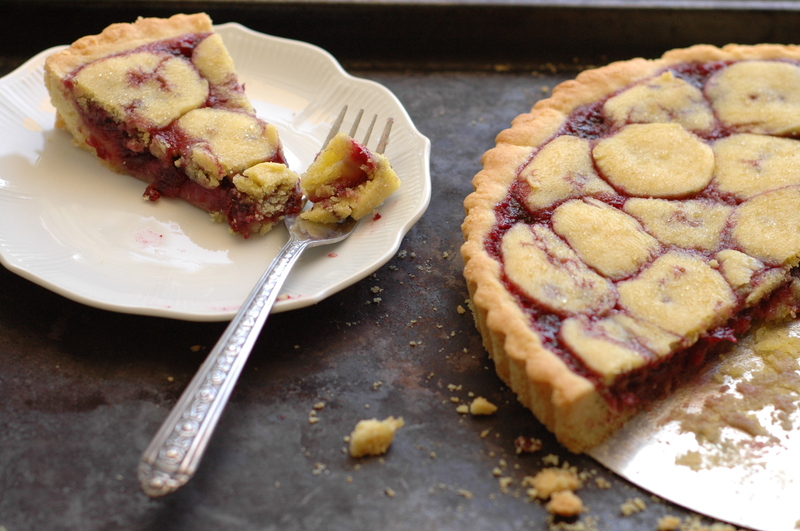 This last week I came across a jam tart via David Lebovitz and it was instant love. Even more perfect, I had just bought a pile of sweet cherries that were begging to be turned into more jam. But I don’t need more jam. I have three kinds of homemade jam in my fridge as I write this. The apricot and peach jam I made last week and a fabulous jar of blackberry jam, made by a friend. 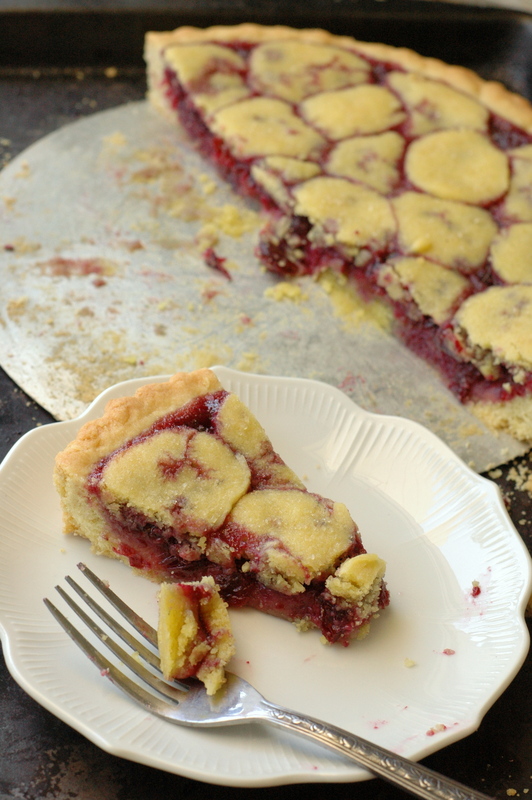 I wanted to find something else to make with those cherries, but after finding David’s tart, the cherries won. 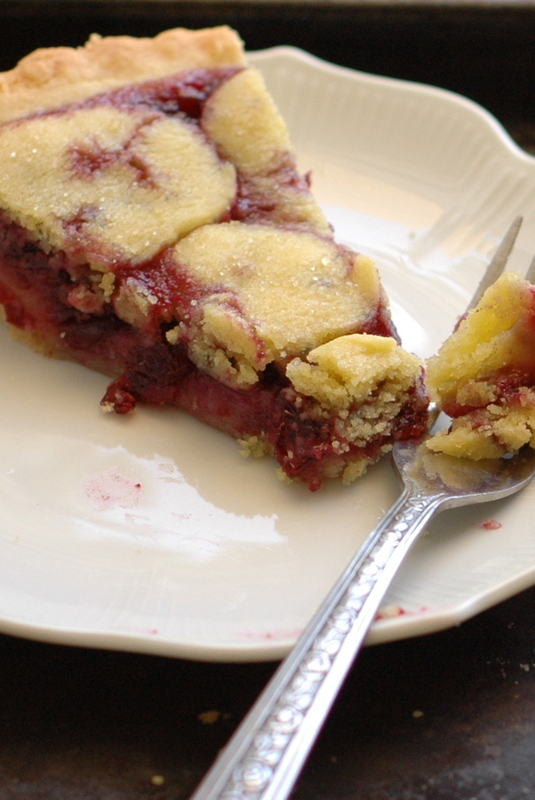 I made more jam… and a tart. 1. Beat together butter and sugar until well combined. Add the eggs and vanilla and mix well. Set aside. 2. In a separate bowl, whisk together the flour, salt, and baking powder. Gradually add the flour mixture to the butter mixture stirring until it forms a dough. 3. Take 2/3 of the dough and shape into a disk. Form the remaining dough into a log about 1.5-2 inches wide. Cover both with plastic wrap and refrigerate for about an hour. 4. Preheat the oven to 350 degrees F. Take dough out of refrigerator and allow to warm up for a few minutes. Press the dough into an ungreased removable bottom tart pan with the palm of your hand until the pan is evenly covered on the bottom and sides. 5. 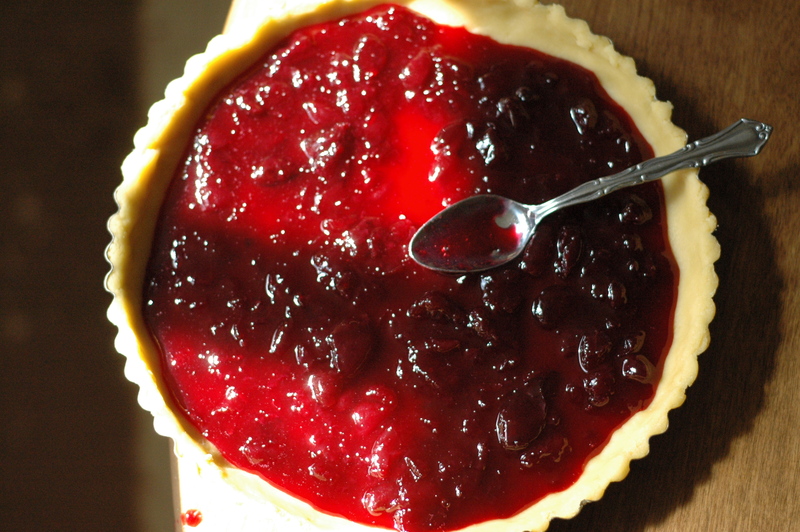 Spread the jam evenly over the tart dough. Take the log of dough out of the fridge and slice into 1/4 inch slices. 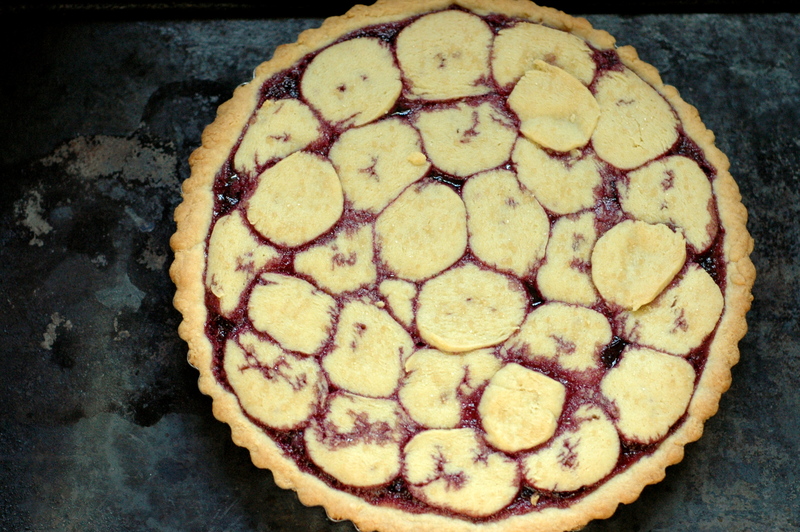 Cover the top of the tart with dough slices. Sprinkle at least 2 tablespoons of turbinado sugar over the top of the tart. 6. Place on a cookie sheet and bake for about 25 minutes or until the dough turns golden brown. Cool before serving. Best served at room temperature, the day after its made, but only if you can wait that long! Oh, yum…! I especially like the “lily pads” of crust over the top. Mmmmm….